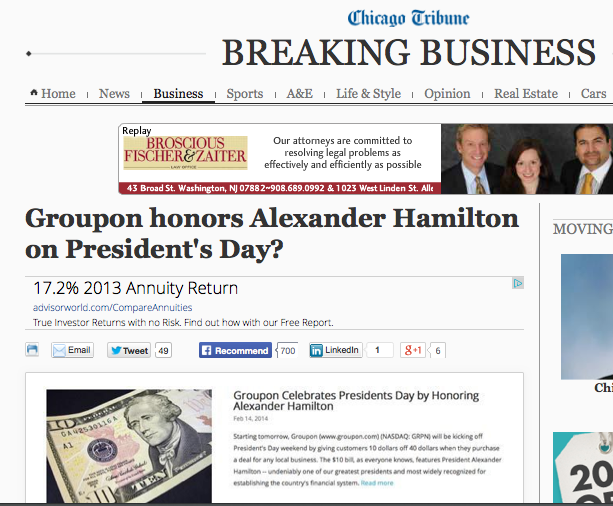 Many media outlets, like the Chicago Tribune, have covered Groupon’s President’s Day marketing stunt. The question is if this stunt hurts or helps the brand in the long term. When activists delivered a 13-foot tall gluten-free cake to Capital Hill in May 2011 to advocate that the Food and Drug Administration enforce gluten-free labeling standards, the stunt worked. There was plenty of media coverage. It supported the mission to which the activists were committed. It alerted consumers to issues surrounding the food they eat. However, Groupon’s latest stunt – calling Alexander Hamilton “undeniably one of our greatest presidents” to promote a Presidents’ Day special – will not serve the brand well. Sure, Groupon is quirky. Some might say it’s quirky to the point of being ridiculous. I’ll also grant you the Groupon stunt is getting buzz. There’s plenty of media coverage (heck, it prompted me to write this spiffy blog post). But this stunt also gives the impression Groupon doesn’t know the facts (e.g., Hamilton was U.S. Secretary of the Treasury, not President). In trying to look too cool for school, Groupon instead comes across as out of touch with details – something that might make consumers wary. Thoughtful consumers might at first be amused. But on reflection, will they trust leaving their credit card information with a company that portrays ignorance as an attribute? Hamilton’s briefly mistaken moment in U.S. presidential history won’t sink Groupon – assuming people are still using it. In fact, in the short run, it will have everyone talking about Groupon. That is what stunts do; they create buzz. It’s the long run that is a problem. How does Hamilton fit the brand? More importantly, how does portraying a fundamental misunderstanding of history convince consumers to spend their Hamiltons, and Washingtons and Lincolns with Groupon? Any good public relations professional will tell you buzz doesn’t always last and stunts like this don’t help the long term reputation of Groupon with consumers. Mr. Hamilton would not be amused or impressed by Groupon’s stunt. Those using his likeness shouldn’t be either. This entry was posted in in the news, pr and tagged brand reputation, coupons, Groupon, history, marketing, marketing stunt, Presidents' Day, retail, Shopping by Rod Hughes. Bookmark the permalink.